“POP EYE” (published In October, 2012), which is a trade magazine of signage industry, carried an article about the application example of Mimaki’s printer "JFX-1631", “Effective Application Examples of UV Printer on the front line”. The following is a textual quotation from the article. 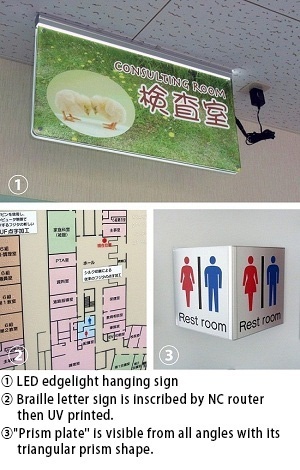 "short delivery time", "on-demand" and "ecology"
Fujita Inc. is consistently engaged in business as a manufacturer specialized for room nameplates and leading the market with its unique technology such as “swing type” and “slide lock” that enables easy replacement of board. 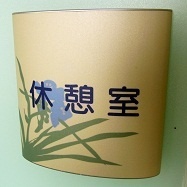 In the early stages, Fujita had proposed room nameplates to school facilities using silk screen instead of hand writing. These room nameplates created a cost advantages by mass-production throughout the country. Currently the company has enlarged the market into hospitals, childcare centers, nursing homes and public offices besides schools. Fujita has been working on the room nameplates by inkjet printers for the past 10 years. In early years, water-based printing and solvent-based printing were used, but nowadays UV printing is used. The company is printing various products with large flat bed UV curing inkjet printer, “JFX-1631” manufactured by Mimaki Engineering. 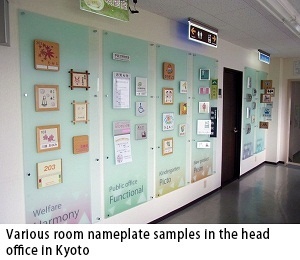 Hirotsugu Fujita, Representative Director of Fujita said, “Since we have changed our room nameplate printing method from silk screen to UV inkjet, our products have been widely accepted by even public offices because of not only by its finishing quality but also by its environmental friendliness. I think we have cultivated a new style of room nameplates with Mimaki UV printer”. He highly evaluates “JFX-1631” by saying, “We chose to install “JFX-1631” considering its high image quality, white ink, detailed support system. We have been studying and learning to make full use of this printer from our experience as well as Mimaki's devotional support service. Now this printer is running in full capacity yet its performance is quite stable. We are very satisfied with this grreat success”. He also says that the advantage of UV printer is not only availability of small lot by on-demand and short delivery time but also the high visual quality of drawing. Unlike silk screen printing, UV inkjet printing enables ink to be sunk into the grain of a wooden board to achieve such high visual quality. He has constructed a new clean room to prevent particles from being adhered on the printing surface. “We are not planning to unnecessarily expand our businesses just because we have large UVIJP. We are aiming at building good relationship with signage/design companies by differentiating us from other companies and expanding awareness that Fujita is a specialized room nameplate manufacturer.” Fujita is now considering to install the latest version of JFX printer and planning its effective operation. Official web site of Fujita Iinc. Official web site of Sogo Hodo Co., Ltd.